German Sanskritist; born at Königsberg, Prussia, Jan. 18, 1821; died in London March 6, 1872. In 1840 he gained his degree of Ph.D. at Königsberg University, where he first studied Sanskrit under Bohlen, continuing his studies in that language at Bonn and Paris. In 1842 he published a German translation of the Sanskrit drama "Prabodha-Chandrodaya" At Paris he collected materials for an extensive work on Indian philosophy and for a new edition of the great epic poem "Mahabharata." In 1850 he went to England, where he assisted Professor Wilson in preparing a new edition of his Sanskrit-English (dictionary. This edition outgrew all practicable proportions, and, having reached page 480 without completing the first letter of the alphabet, it was abandoned. Goldstücker was professor of Sanskrit at University College, London, from 1851 until his death, and was the chief founder of the Sanskrit Text Society, established in 1866. He was also president of the Philological Society, and was well known in many of the literary societies of London. He left an edition of the "Nyaya-mala-Vistara," an important work on mimansa philosophy, and an edition of the "Mahabhashya," the well-known commentary on Panini's grammar (London, 1874); he had previously written a monograph on Panini (1861). 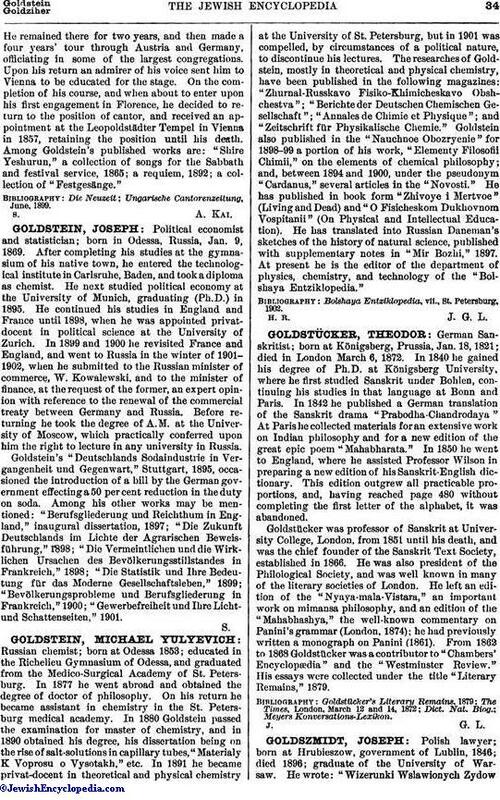 From 1862 to 1868 Goldstücker was a contributor to "Chambers' Encyclopædia" and the "Westminster Review." His essays were collected under the title "Literary Remains," 1879.